As you can probably tell, I love a deal. So, when I found out about Apple’s 30-day FREE trial of Aperture 3, its photo management and design software, I jumped on the chance. Aperture 3 is the most recent version of this software, just released this February. Note this program can only be used on Intel-based Macs running an operating system of Mac OS X v10.5.8 or v10.6.2 or later. Being a Mac devotee, and already familiar with Apple software such as iPhoto and iMovie, I figured that Aperture would have a similar interface and was eager to give it a try. I’ve never made a book with iPhoto, so given that iPhoto and Aperture books are printed by Apple, it was a good opportunity to try out Apple’s print quality. You don’t have to print your Aperture created photo books with Apple however, you can export your book as a PDF and print it with any photo book company that accepts PDF files. Aperture does a lot more than provide a design tool for custom photo books, so for an overview of Aperture’s other features check out my Apple Aperture main review page. Here, I’m naturally going to focus on the photo book tool. One year later I’m still working on my honeymoon photo books. 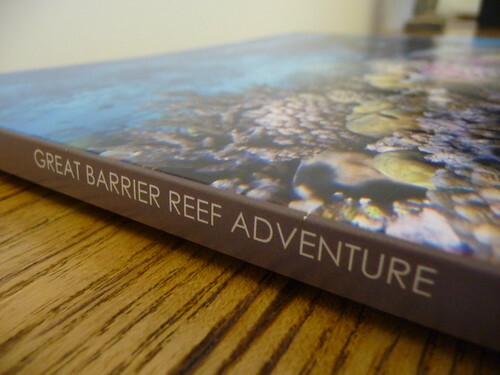 I say “books” cause this book showcases only one day of our two-week trip to Australia and New Zealand. It’s such a beautiful part of the world and a place I’d always wanted to travel to. It was so much fun experiencing it for the first time with my hubby and someday we hope to get back there. These photos also mark the very first time I’ve shot photos underwater – and what a place to shoot! 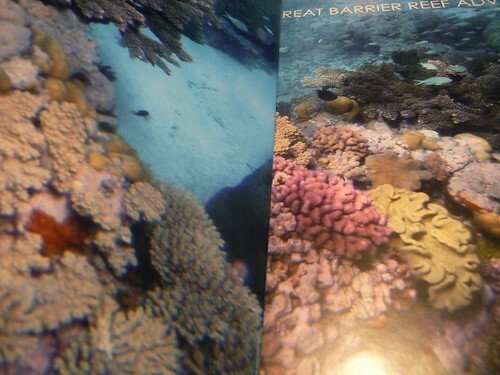 The Great Barrier Reef is everything people say it is and more. We rented a point and shoot camera with a specially made underwater housing at the last minute from the tour boat operator for about $65 USD and note that these were taken not while scuba diving, but just snorkeling. (I haven’t learned to dive yet, but want to!) These shots have a long way to go to measure up to some of the breathtaking underwater photos I’ve seen and aspire to, but I think they came out really good for my first time out. 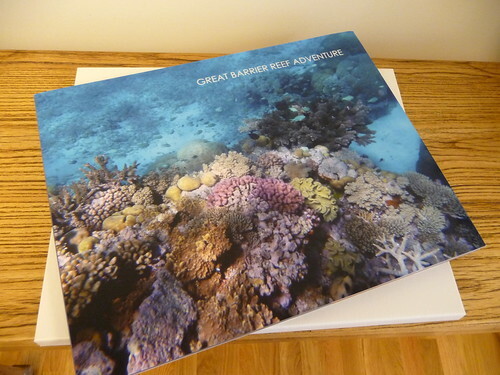 The Great Barrier Reef is just that amazing – I don’t think anyone can take a bad photo there! The point I’m trying to make is that you don’t need an expensive or fancy camera. You just have to give it a try and take lots of photos. You’re only limited by the size of your memory card so just keep shooting. That goes for underwater photography or on land. One important tip I got from the resident tour boat photographer was to shoot where there’s plenty of natural sunlight and that definitely made a difference. A final note about underwater photography – don’t delete your shots too soon and only do so in the field if you’re running out of memory. Many photos that I thought were for the trash, came out surprisingly better after adjusting levels in Adobe Photoshop. Everything shifts to the blue end of the spectrum underwater so you very likely have to do a little tweaking in a photo editing program. It’s not hard though. Most times I just hit the “auto levels” button and then adjusted brightness and contrast a bit. For those who are interested, the camera we rented was the Olympus u1030SW which is a 10.1 megapixel camera. Wouldn’t have known but for the camera data that’s automatically recorded with the photos. The download from Apple’s site was pretty painless and before I knew it the program was up and running. I do have to admit one thing here, when it comes to using photo book software from any company, I don’t like reading directions. I occasionally check out video tutorials just to get a quick overview, but I like to jump right in and then if I have questions, I’m all over the FAQs and Google and we just go from there. I found the software to be easy to navigate. I uploaded photos from iPhoto and selected one of 11 provided themes – “Journal”. I decided to go with the themed template and then tweak from there. You can fully customize your layouts in Aperture which should be expected given the cost of the program. Once I selected my theme, a complete set of templates popped up to fill a 20-page book. 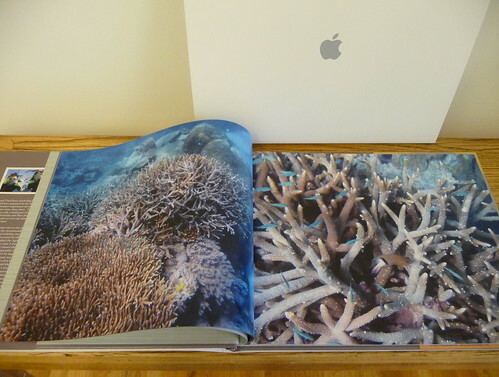 Note that with Aperture’s hardcover books, not only can you customize the cover, spine and back cover which are printed directly onto the surface of the book, you get a matching custom dust jacket with inner flaps that can also be customized with photos or text. The dust jacket is included in the price. After selecting the theme, a complete set of layouts appear for a 20 page book. The program works similarly to other programs, with drag and drop capability. You can resize boxes, create your own layouts, adjust the part of the photo that’s visible within the frame and add captions. The font selection at over 300+ was very extensive and you could choose any color font. I kept my changes very simple and pretty much stuck to the theme. I altered the layouts to best showcase my photos which brings me to one of the best features of the program – the ability to easily create 2-page spreads. In fact, the program has more than 10 different preset two-page spread layouts so you can easily drag and drop a photo and have it automatically stretch across both pages of the spread. In other programs that do not have this type of layout ready-made, it’s often a crapshoot if you do it manually whether it will come out right. 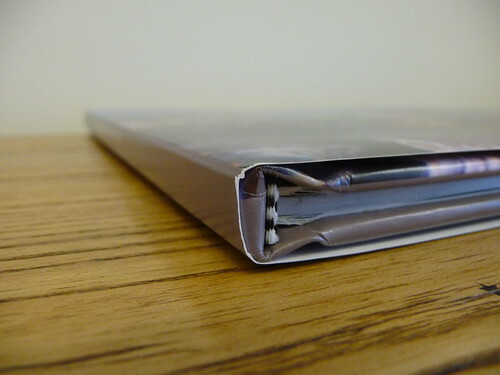 Here, as with all books with a gutter, you do lose a good amount of the image in the binding of the book, so it’s best not to put anything crucial that you wouldn’t want to get swallowed up in the center, like someone’s face. 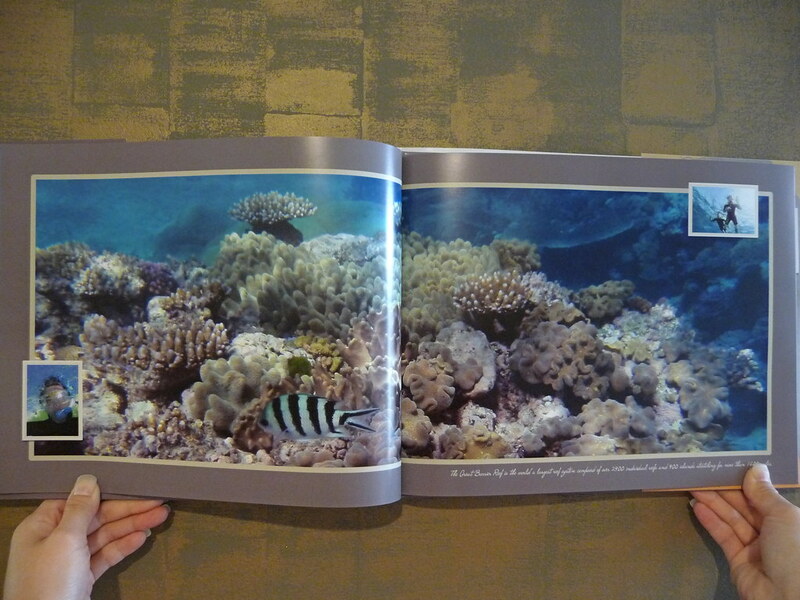 A number of pre-designed two-page spread layouts are available and can be customized. Before: Preview of the two-page spread I created with a simple drag and drop. 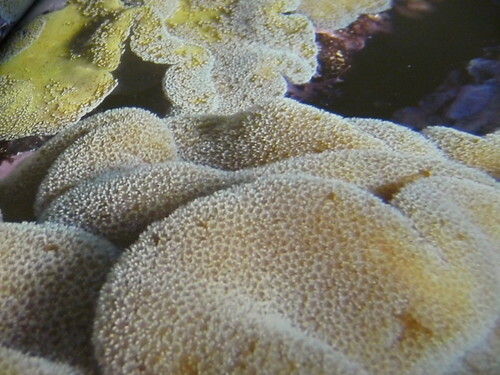 Zoomed in detail of the two-page spread. Another cool feature is the map function. 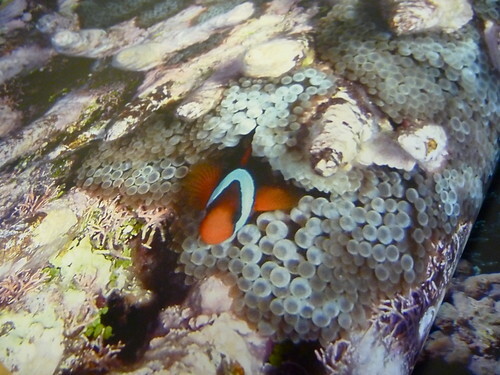 It’s a nice element to have in a vacation photo book. Even if your camera doesn’t have GPS tagging, you can make a map with Aperture. Just type in the city and possible matches pop up on the map. You can label the map and also choose to have it illustrate a path connecting the cities to show the route taken on your trip. Aperture's map tool is easy to use. 1) I wanted to have more control over the width of frames for the pre-made inset photo boxes. I couldn’t seem to get them adjusted. 3) More themes would be nice – I understand that customization is the main highlight of this program, but 11 themes don’t offer enough variety. 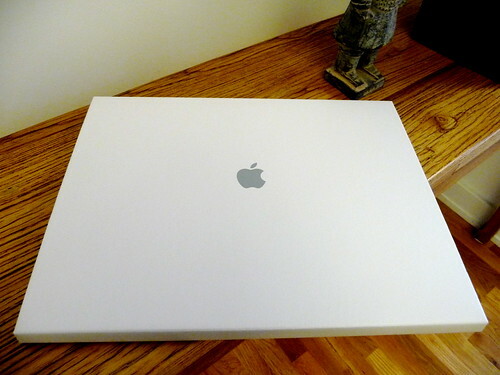 The book came in a nice white sleeve with Apple’s logo on the front. Note that no other logo appears anywhere in the book itself, just on the white sleeve. I don’t know if that’s the case with the softcover books however. The dust jacket was made with sturdy paper stock, but I know it’s going to get some wear and tear. I’m not a fan of dust jackets, but since it didn’t cost extra, and because the inside flaps were customizable, then why not. 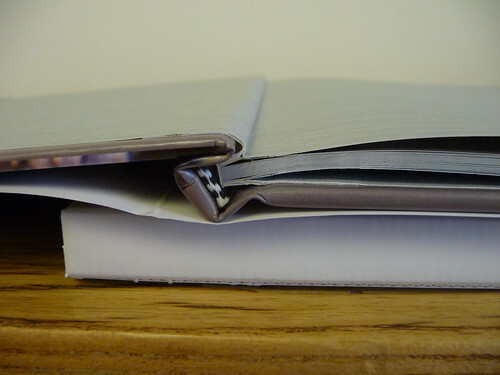 The case binding felt sturdy and was neatly constructed. 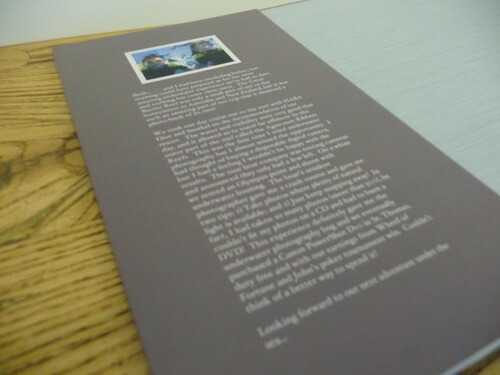 A textured gray overlay is glued to the inside cover and extends across to act as a cover sheet and was a nice touch. The same paper is covers the back page and rear interior of the book. 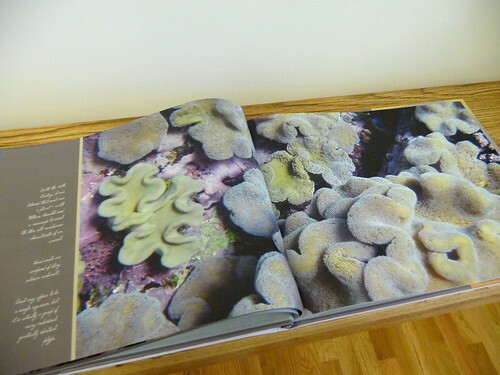 Comparison shot of dust jacket cover (L) with internal hardcover printed directly on book surface (R). A screenshot from my Photo Book Wizard tool which makes it easy to find and compare photo book companies. I found Aperture’s print quality to be very good and detail shots came out sharp. 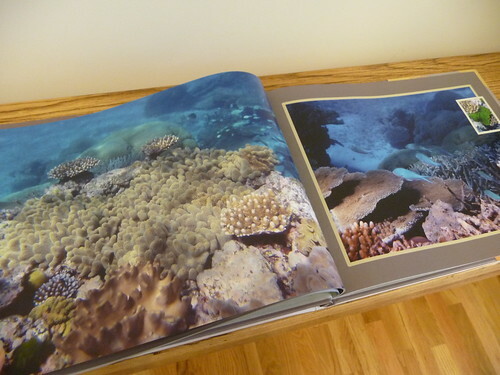 Colors were well saturated, though I would have preferred some pages to print a little brighter. If I were to make another book with Aperture, I’d boost the brightness on any photo that I feel would benefit from it. Overall, I was very pleased with the quality of the book. 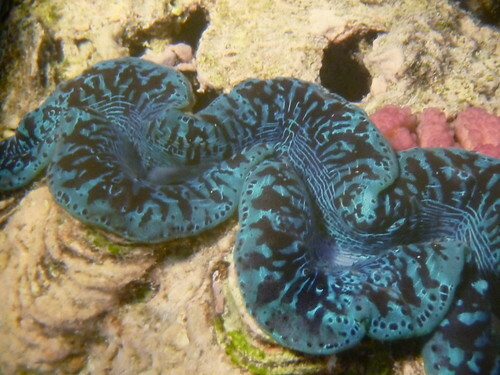 Another close up of a giant clam. Would I use Apple’s printing service again? Yes, I liked the product and liked the customization. More photo book companies should take Aperture’s lead and offer a two-page spread – can’t be that difficult! Would I pay $199.00 for the Aperture software? Probably not now, but maybe in future if more photo book companies create a plug-in so that I can easily create books in Aperture and know that when I upload to a given company that I’m going to get what I think I’m getting. Currently, some high-end photo book printers (that to my knowledge only work with pro photographers and not consumers) have created plug-ins for Aperture that greatly streamlines the process. They have created pre-set templates for each of their photo book products which makes the process more certain and you know you’ll get proper support if you have any issues. I wasn’t able to find much detail on final Apple Aperture print quality on the Internet, so I hope this helps other Mac owners who are considering the program or want to print books with Apple. No reason not to check out the free 30-day trial! What do you think of Apple Aperture? Add your comments below! 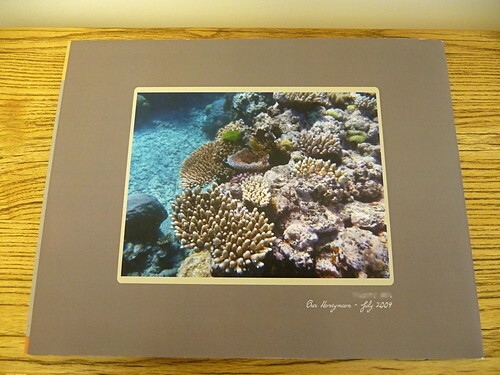 7/16/2010 Update: Have you wondered if there’s any difference in photo book print quality between iPhoto and Aperture 3? Check out my post. Thanks for posting it. I was on your site a few times when building the book since I am a new to Aperture and I found your site very helpful! Thank you Photobookgirl for your detailed review. I would have liked to see a more detailed comparison between Aperture book and similar books from other companies more than just the price. like comparing reliability of the publisher, print quality, paper quality, and color quality. I use Aperture in a daily basis and hardly have the time to try other book printers so your site (that I found through maccreate.com) is a great resource. In terms of the large size (in this case the 13×10) I made mention of the only other company I’ve tried in a similar size which is MyPublisher. I noted that I like MyPublisher’s paper more than Apple’s as it’s much, much thicker which is great for a large format book like this. In terms of other companies: I have three posts I’d say are my key comparison posts to date: Snapfish vs. MyPublisher, Blurb vs. Mpix and a Snapfish vs. MyPublisher vs. Blurb vs. Mpix comparison post , so I hope you’ll check those out for now. I also welcome you to fan me on Facebook as I post unique content there all the time and you’ll get updates whenever I check out a new company. Thanks! The website above is the link of the e-version of the book I made with Aperture 3. Really enjoyed the review! I was looking around to see if you could, in fact, get plug ins for other printing companies. Sounds like you can! You cant beat the ease and intuitiveness of Apple products!! b/t/w I noticed from your site that you’re in Wilmington, NC – we watched the July 4th fireworks on the Cape Fear River two years ago – my husband surprised me with a trip there right after we proposed. Plus, we’ve planned a trip to the Outer Banks soon too! I just found your blog and think it’s awesome! The only thing I didn’t like about aperture was that those two-page spread layouts aren’t available in every theme. You can modify, but it’s still not the same. I made some custom layouts and did the two-page spread on those. When you say it’s not the same – did it not print out right, or was it a software issue? I’m still debating whether to buy the program… Thanks for your comment btw – I’m glad you like my blog! Enjoyed your review of Aperture Photo Books. I’m making one (using the 30 day trial) and cannot figure out where to create the “cover” and the “spine” for the album. Mine just seems to show the dust jacket and then the title page. Any suggestions? Hi Shirley! From what I recall, since the cover and spine are the exact duplicate of the dust jacket version, you only have to create it once. So, it’s automatic. I guess if you wanted a different jacket cover and spine from the interior you wouldn’t be able to do that, but most book interior covers are duplicates of their jackets, so you should be fine. I unfortunately can’t double check that for you since I already completed my trial and haven’t bought the program as of yet, but I bet you’re okay. Thanks for a great review. Very comprehensive and nicely written. I am now somewhat familiar with the photobook making process with Aperture 3.1, with 1-98 page Apple soft-cover delivered ($86) and 1-100 page hard cover ready to send ($170). 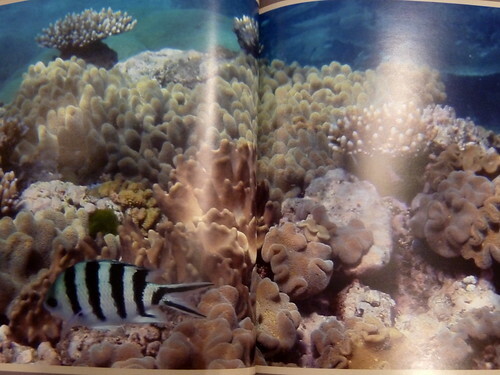 I have also completed a 20 page hard cover with Picaboo ($16) and 1-112 page hard cover book from Snapfish ($140). Something missing from all three book making processes are grids and rulers. There are distinct advantages to staying inside the Apple products (including iPhoto). With Snapfish, one has to upload photos and transfer them from Flickr to sort things out. They had the right style of book for my DisneyLand book, Aperture didn’t have the right default template, but I think I could have gotten there manually. The Picaboo application is nice in that it keeps the photos on your computer until you are ready to purchase and then it uploads them for publication. However, one has to import the pictures first, so I think there ends up being two copies of each of the pictures. The purchasing process is roughly equivalent, if one has an Apple store account. Although Apple isn’t the most expensive option, I would say (so far) it is a premium price for a good outcome. But then, one must consider the source, literally, which in this case was me. I will order the hardcover after payday and should get it in a very reasonable time-frame. All three company’s have been equally good at delivery, IMO. I definitely benefited from this web site and the Facebook pages as well. I’d like to say thank you, but I haven’t discerned PhotoBookGirl’s first name. Your efforts, communication and presentation are greatly appreciated. You’re very welcome Rojer! Wow, you’ve really been busy making books haven’t you? I agree with you that grids and rulers are essential. I also prefer when the software has some kind of tool that aligns the items like a snap to grid. What’s good is that companies are listening to their users and there have been a number of companies that have updated their software. What comes to mind is AdoramaPix’s new alignment tool and Picaboo’s new lay flat feature. MyPublisher went from only fixed templates to customizable templates (PC version) not too long ago and all these advances give us more options. If you want to make an easy quick book, most if not all the companies have an auto book building function. If you want to go custom, you’re only limited by your imagination. And with these software programs being free to download and use, you don’t need Photoshop or an external design program to make a really amazing book. I look forward to hearing more about your experiences and thanks for sharing with my readers! Oh my word … I have SO much to learn!!! I created and then ordered a 70 page book. it is 11 am now and it is still uploading. Do you think this is ok? I feel like I’m following in your footsteps. I just completed my first Aperture book — I’m anxiously waiting to see how it turns out! 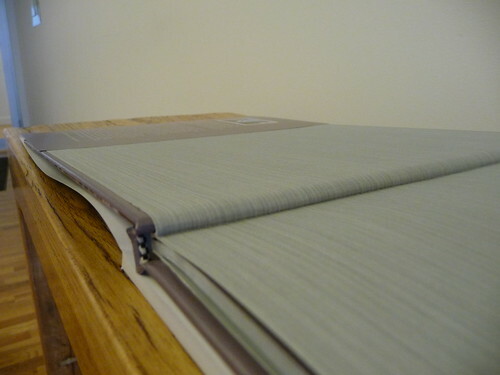 And like you I chose the Journal theme, delivered in a large hardcover. By the way, it is possible to change the dimensions of the inset photo frames. Just switch to editing layout, select the relevant frame, and drag an edge to suit. Can I import an iPhoto book that I’ve created into aperture and keep my layouts? I created a book in iPhoto, but now that I know about all the cool stuff aperture has, I’d like to finish it in aperture. Is it possible to get all of the page layouts to import into an aperture project?? Sorry Lizzie, I’ve never tried it and I’m not sure that Apple wrote that into their programming. Have you tried doing a google search on that? Lizzzz, try my photo book wizard. At the results page you’ll see the option in the pull down menu for “high capacity” (which means over 100 pages) – you’ll see which companies offer that. Just export as jpeg and you should have no problems. Blurb and a few other companies will go well above 100 pages. I actually wrote a post about your question regarding high page count books here, but make sure to go through the wizard cause more companies now go above 100 pages than what was listed in the post. Best of luck on your book! I am getting ready to make my first photo book. I tried a few months back with iPhoto but ran into problems editing so bought Aperture….and then I got sidetracked and have not looked at it since. So I am finally getting around to learning something about the software …it is a huge learning curve for me. I have been researching online for close to 6 hours now and accidentally came across your site. I LOVE IT! You clearly answer the questions I have been Googling most of today! Thank you so much “Photo Book Girl”! I feel better starting my photo book knowing you are there if I run into problems! Great site! Dulcie – I’m so glad you like my site. You’re welcome! There’s lots of info here b/t/w: http://www.photobookgirl.com/blog/how-to-make-your-own-digital-photo-book/ Hope you enjoy making and seeing your book!